Inspired by the Napa Valley and The Culinary Institute of America's California farms and gardens, The Restaurant at CIA Copia offers a distinctive dining experience where simple, seasonally-inspired dishes are paired with a curated selection of wines, beers, and handcrafted cocktails. Interact with chefs in the beautiful open kitchen and experience true hospitality from our staff. The restaurant's sleek and comfortable atmosphere is perfect for a celebratory evening or as a go-to hang out. Dine in the restaurant, order a drink at the bar, or grab a couch in the lounge. 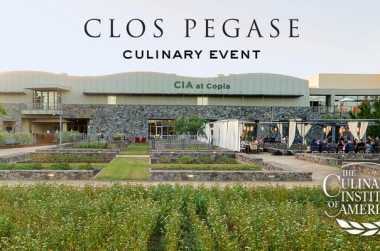 Enjoy an unforgettable dining experience and friendly camaraderie at The Restaurant at CIA Copia! Sunday Brunch: 10:30 a.m.—2:30 p.m. Happy Hour: Monday—Friday, 4—6 p.m. Enjoy our seasonal menu al fresco on our beautiful outdoor terrace and lounge or play a round of bocce, while you sip on a cold beer or glass of wine.